Yesterday the lunch special at Reposado in Palo Alto was green shrimp posole, a hominy stew with shrimp as its central feature (and with other shellfish in the stew) and with green sauce (salsa verde, made with tomatillos). Fabulous. So tomatillo was today’s morning name, but for an entirely explicable reason. I’m going to focus on tomatillos here, but first some words on posole. Discussion of posole (and hominy) in a section of a posting “Thanksgiving meals” of 11/24/11, a section about classic posole: red (with salsa roja, tomato sauce with chiles, or just red with chile powder) and featuring pork. If the menu just says posole, this is what you’ll get; it’s the unmarked hominy stew. But there are other possibilities: green rather than red, and featuring some central protein other than pork — in particular, chicken (or other poultry) or (swoon) slow-braised lamb. Even (I now discover) in a vegan version, red or green, with tofu and a vegetable broth rather than a meat or seafood broth. 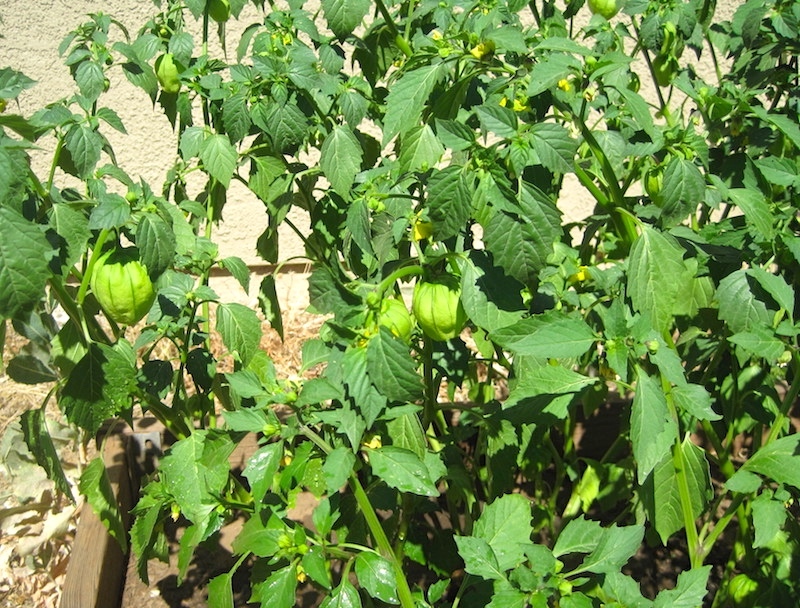 The tomatillo (Physalis philadelphica), also known as the Mexican husk tomato, is a plant of the nightshade family bearing small, spherical and green or green-purple fruit of the same name. 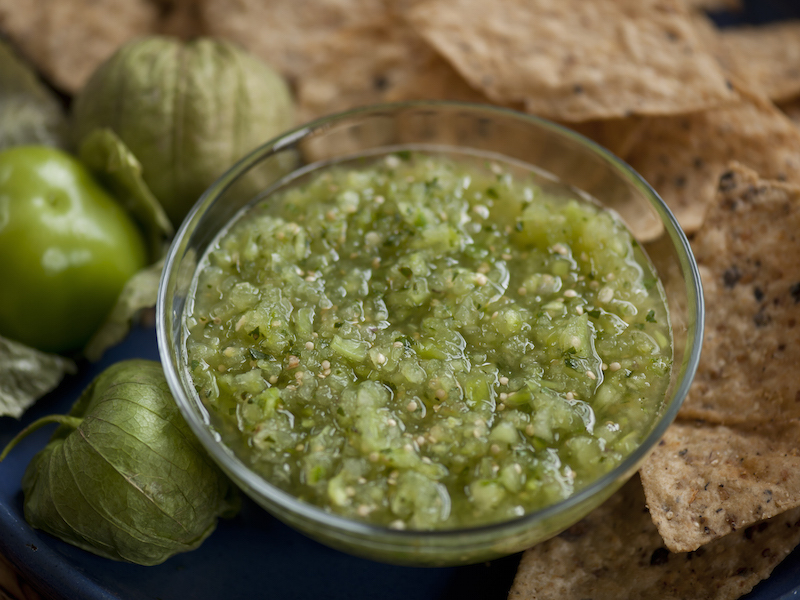 Tomatillos originated in Mexico and were cultivated in the pre-Columbian era. A staple of Mexican cuisine, they are eaten raw or cooked in a variety of dishes, particularly salsa verde. 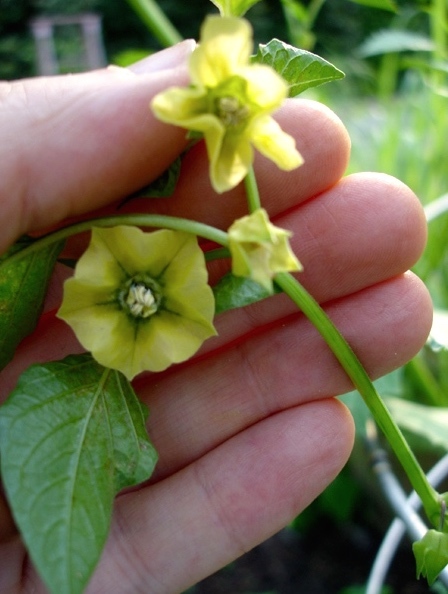 … The tomatillo fruit is surrounded by an inedible, paper-like husk formed from the calyx. As the fruit matures, it fills the husk and can split it open by harvest. The husk turns brown, and the fruit can be several colors when ripe, including yellow, red, green, or even purple. The freshness and greenness of the husk are quality criteria. Plants in this family include a number of food plants, some ornamentals, and several seriously poisonous plants, like Jimson weed and deadly nightshade. In fact, portions of virtually all of the plants in the family are packed with alkaloids that range from mildly to mortally poisonous (for the tobacco plant, famously, the alkaloid nicotine). For the potato plant, only the mature tubers are entirely safe, and for the tomato and tomatillo plants, only the fruits. Solanum crispum is a species of flowering plant in the Solanaceae [“nightshade”] family, native to Chile and Peru. Common names include Chilean potato vine, Chilean nightshade, Chilean potato tree and potato vine. Growing to 6 m (20 ft) tall, it is a semi-evergreen, woody-stemmed climbing plant. The small blue fragrant flowers, 2.5 cm in diameter, with prominent yellow ovaries, appear in clusters in summer. They resemble those of the closely related potato [Solanum tuberosum]. Very small poisonous berries are produced in autumn. All parts of the plant are to some degree poisonous. This entry was posted on December 29, 2015 at 3:38 am and is filed under Language and food, Language and plants, Morning names. You can follow any responses to this entry through the RSS 2.0 feed. You can leave a response, or trackback from your own site.